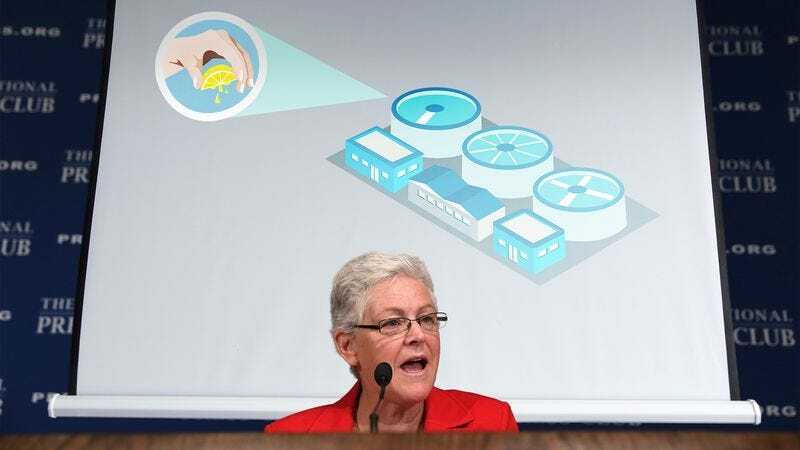 WASHINGTON—In an effort to improve quality and refreshment levels, the Environmental Protection Agency announced Tuesday that municipalities around the country will begin adding a combined 500 million squirts of fresh lemon to the U.S. water supply. “Starting this week, water utility workers will infuse the nation’s drinking supply with enough lemon to ensure that the 30 billion gallons of water that citizens use daily has a crisp, invigorating taste,” said EPA administrator Gina McCarthy, detailing a plan to add a “bit of zest” to the country’s potable water reserves by spritzing the juice contained in hundreds of millions of individual lemon wedges into reservoirs, wells, and freshwater lakes throughout all 50 states. “We believe the hint of citrus will both taste great and leave citizens’ hands smelling nice and lemony whenever they wash them. For decades, Americans have been forced to make do with the bland, flavorless water coming out of their faucets, and we believe this latest effort will really liven things up.” According to sources, the EPA hopes its new plan will be met more favorably than its decision last year to supplement the water supply with 350 million tons of whey protein powder to bulk up the nation’s muscle mass.